I spent a lot of time undercover within minkhunting in the early 1980s and early 1990s, posing as a supporter, in order to understand how it worked and photograph and film the cruelty that took place. Hunting mink with packs of dogs was a game that evolved out of otterhunting years ago. It was cruel by design and cruel by calculation. The dogs used were bred not for the speed that might produce a quick kill but rather for the stamina that guaranteed the lengthy chase the supporters sought. There were no instant kills. All were designed to be protracted to entertain the hunt followers. Minkhunting was banned by the Hunting Act 2004. The 1911 Protection of Animals Act, if interpreted in common parlance, would have banned this cruel pastime long before 2004. Scandalously, a specific exemption barred “wild animals” from being construed as “animals” within the meaning of this Act. This anomaly allowed the cruelty inherent in this amusement to continue for years. The mink that were hunted are imported North American mink brought to the UK by the fur trade in 1929. Poor standards of husbandry inevitably led to mink escapes and after WWII, with the failure of many farms, some mink were simply released to the wild by farmers. The farmers thought they were releasing the mink to die but the mink found a habitat similar to their North American one and with the declining otters numbers mink soon established themselves on our river systems. With the decline of otterhunting, due to shortage of otters, the otterhunters took to hunting mink in increasing numbers and minkhunting became important to those seeking summer hunting. Hound enthusiasts had a real need to find some form of hound “sport” to fill in the gap between the end of one foxhunting season in April and the start of the next the following September. When, despite spirited defence by hunting enthusiasts, the otter was given legal protection in 1978, making continued otterhunting difficult, minkhunting filled its place. The otterhunt packs simply changed their names – they ended the 1977 season hunting otters and by the following Spring they were hunting mink. The same people used the same hounds to hunt the same rivers in the same fashion and they claimed never to be hunting otters, only mink. Understandably conservationists observing the situation and concerned for the wellbeing of the otter that at that time was on the brink of extinction in the UK, were sceptical. Minkhunting took place from March to September. This encompassed the breeding season: mink were hunted when pregnant and when nursing their cubs. The dogs, often retrained foxhounds, were followed on foot. Terriers were allowed to run freely with the hounds poking their noses into every nook and cranny they could find. When the terriers showed interest in any hole by the riverbank the hunt terriermen would often dig it out. When a mink was found it would flee along the riverbank, swim in the river or climb one of the trees alongside the river. The mink is only a small animal and not a particularly good swimmer (unlike the otter) so few hunts lasted long. If the mink climbed a tree hunt supporters could climb the trees after it and shake the branches to try and dislodge it, they could throw items at the tree-bound mink to try and knock it down or in extreme cases they would take a chainsaw to the tree and try to cut it down. 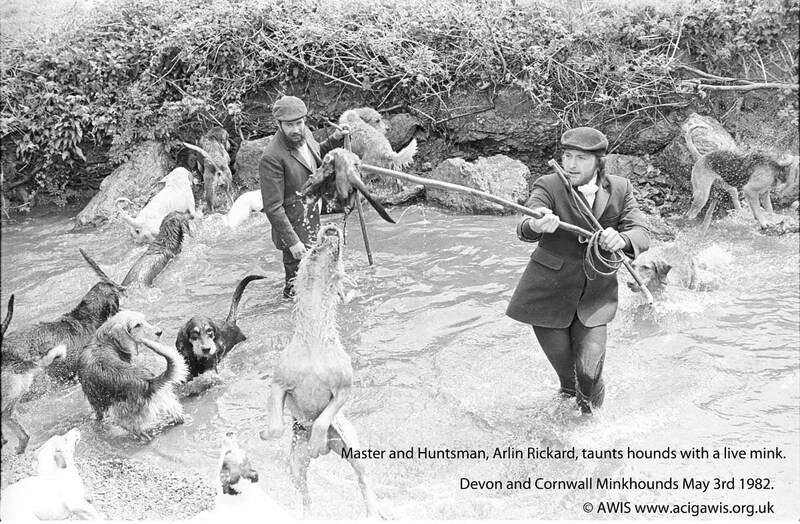 The fun for the hunters focused on the contest between the Huntsman wielding his dogs to follow the scent left by the tiring quarry, the efforts by hunt followers to track the mink and give its location to the Huntsman, and the frantic escape attempts of the mink. Some mink were caught above ground or in the water. There could be a fight between the mink and the lead dog but if the pack were there in numbers their victim, about the size of a hairy slipper, was soon dismembered. Some hunters told me that the mink must taste bad to their hounds as whilst the hounds would certainly snap at the mink they would often be reluctant to bite through it. As a result some of the kills were more protracted than might have been expected. Many mink succeeded in finding refuge below ground. Terriers were then entered to their sanctuary to bait them. The mink may be killed by the terriers, shot, evicted, or left injured. The latter could happen when the mink found refuge in a particularly strong place. The terriers could get at the mink to worry it but the terriemen could not reach it to kill it. They would reluctantly have to pull their terriers out and leave the mink – alive but far from uninjured. Traditionally this climax to the day’s fun attracted great interest from the hunt followers but with the use of movie cameras by undercover investigators, such as myself, it also provided vivid images of cruelty. Accordingly, hunt rules were changed to try and hide it from public view and sanitise it. However hunt terriers operate beyond the realm of rules and at the interface between terrier and mink in the dark tunnel, the conflict was as bloody as ever. To justify their obvious cruelty minkhunt supporters claimed to be involved in “pest control”. However the Burns Inquiry found that: “the contribution made by mink hunts to the control of mink populations nationally is insignificant”. Minkhunting was haphazard and ineffective. Far from being a means of control it was often the exact opposite - because not all mink hunted were caught, those that escaped were often driven far from their original territory, it played a significant role in spreading mink throughout our waterways. Individual mink could be caused immense suffering by this pastime. The Burns Inquiry, after exhaustive study, found that minkhunting “seriously compromises the welfare of the mink”. Minkhunting, through the disturbance it caused to the riparian habitats also posed a serious threat to the recovery prospects for the otter. The former minkhunts have tried to continue by exploiting a variety of loopholes in the Hunting Act. Some claim just to be exercising their dogs; others claim to be hunting rats; all are very secretive. Given that the otter population has mercifully recovered to the point where otters are now believed to frequent nearly every river in Britain and given the legal protection afforded to the habitat of the otter it is hard to see how there can be any hunting with hounds of our riverbanks that does not infringe otter protection legislation if not the Hunting Act itself. There is no humane nor legal alternative to minkhunting that can be recommended in the riparian habitat because of the disturbance threat to otters. If people want to follow hounds in the summer months they can do so only if their hounds are kept well away from rivers and lakes and if they hunt a truly artificial scent that is not animal-based. Packs of dogs could easily be taught to hunt the scent of a person fleeing or of a trailed rag with an artificial scent. Aside from being humane there is none of the mayhem associated with minkhunting as the route is controlled. Hunted mink could flee anywhere. Into gardens, over roads, railway lines etc. At such times the hunt frequently lost control of their dogs. Pets and livestock could be harassed or killed by rioting dogs. Water fowl such as moorhens proved to be particularly vulnerable. Draghunting could be enhanced to better simulate minkhunting with the guile of a man, rather than the terror of the mink, pitted against the Huntsman. Clay pigeon shooting, once derided as a poor replacement for shooting live pigeons released from traps, now thrives whilst the latter was banned. Likewise humane hunting, with no animal quarry and the only missing element being digging-out, could provide a real boost for the rural economy.